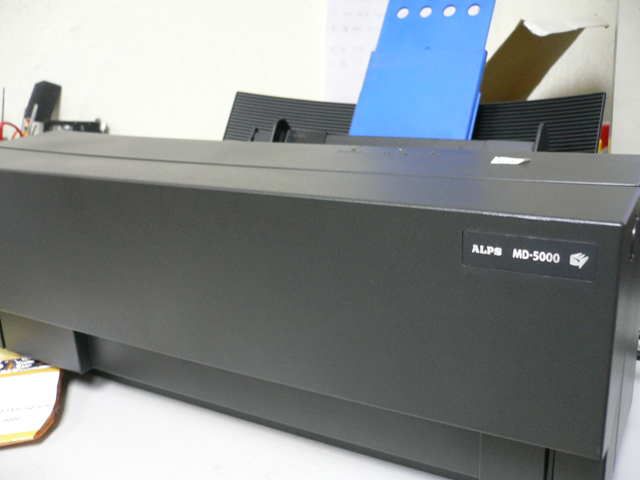 The Alps MD-5000 Photographic-Quality Color Printer is a Micro Dry thermal resin printer capable of 600 or 2400 dots per inch printing for both monochrome and full color images. Alps uses a thermal-resin technology that places various-size dots onto the paper using resins with pigments. Alps also uses Micro Dry inks, which are ribbon-style cartridges, to apply ink to the paper. Since the inks are dry, they are waterproof, smearproof, and fadeproof and back to back printing is possible. There is a wide range of ink cartridges you can use, such as the standard CMYK colors as well as metallic colors; high shine foil gold and silver; and even white for printing on dark paper. Each color or ink type has its own separate ribbon cartridge, which is more economical because all the colors usually don't get used up at the same rate. You only have to replace the colors you need and not the whole container. The MD-5000 is actually two printers in one. (1) The standard Micro Dry mode is a dithered 600 dpi or 2400 dpi thermal process that places dots onto the paper. 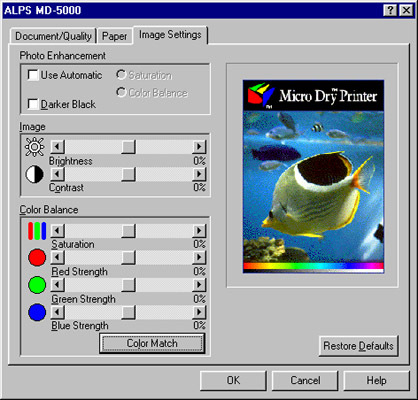 (2) But the Alps MD-5000 can be upgraded to a dye sublimation mode/printer, using an upgrade kit and photographic ribbon-style cartridges, in which ink dyes are vaporized (the colors are turned into a gas), and then sublimated into special paper. Dye sub printers deliver the closest quality to a photographic print as they control not only how many dots of color they put on the page but the intensity of the dots, producing a continuous tone like a photograph. The prints actually look and feel much like the drugstore color print you are used to looking at, delivering the best color clarity and sharpness. For dye sub printing, you need to use special paper, but with the standard mode, you can use laser paper or even plain copy paper if you use a primer ribbon provided by Alps. Also with the MD-5000, you can produce excellent quality images on virtually any printable surface including transparencies, cardstock, T-shirt transfers, overhead transparencies and embossed foil surfaces. 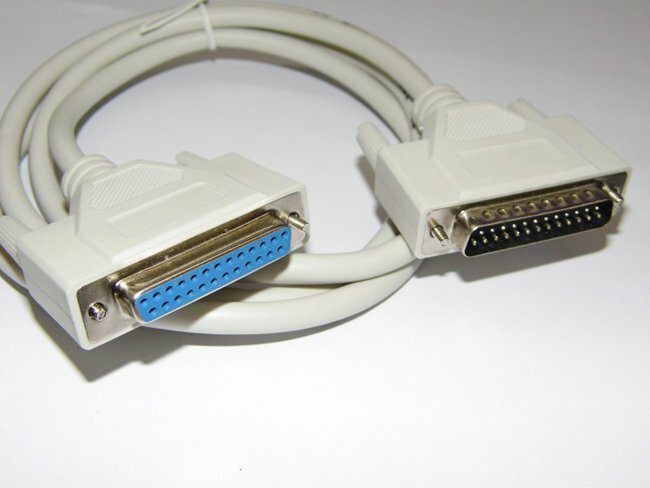 The Alps MD-5000 is available with either a bi-directional parallel port for Windows-based systems or a SCSI module for Macintosh OS V7.01 or later. Price: PC Printer ($599); Mac/PC Printer ($649). Optional features are: Dye Sublimation Kit ($99); USB Interface Kit for the iMac OS V8.01 and Windows ($99); and Adobe PostScript 3 with Pantone Color Matching for Macintosh ($149.99). Serious Beginners, Intermediate, and Advanced computer users. The printer is not difficult to use but I suggest that it would be helpful to have a solid understanding and some practical experience using printers, but it is not absolutely necessary. There are a variety of ribbons, and papers settings that might seem confusing to a very beginner. Once you become familiar with the ribbons, papers, and settings, it is easy to use. I had problems with setting up the printer as I had a variety of other peripherals attached to the computer and the Alps can be finicky if you are using other printers. It doesn't like switches, prefers its own parallel port, and wants to have a LPT 1 address. If you are unfamiliar with setting up a printer, especially with bi-directional printers, or have other printers attached to your computer, you might consider getting help. There are two User Guides, one printed and the other on the CD, that come with the printer but I found them confusing. Don't let these factors deter you from purchasing the printer, though. It is well worth the few hassles you might encounter. The printer is perfect for graphic artists, professional photographers, serious hobbyists and small businesses who need the best possible color output for a variety of digital printing applications. Reusable EconoBlack ink is available for extended ribbon life and inexpensive black-text printing (use up to 20 times). Installation: I did have difficulty with the installation. Part of the problem was that I wanted to use the printer with a PC computer that probably had more peripherals, including other printers, attached to it than most of your stores have for sale. Nowadays, it is not uncommon for the average computer buff to have a variety of peripherals and printers so I thought this was a good test to see how the Alps handled the situation. I can just hear all the die-hard Mac users mumbling under their breath: "What did you expect from a PC; use a Mac." But the other printers I had attached to the computer were Hewlett Packard laser printers and Epson inkjet printers and I had no problem installing them. Well, when it came to the Alps, it was a comedy of errors. First, you need bi-directional cables and/or switches and the local store gave me the wrong cables. Then I wanted to use an internal switch to go from one printer to another but couldn't find one that would accommodate all the printers I wanted to use. I tried one external switch but wasn't sure it was bi-directional and then tried another. Still nothing would work. Again, the store wasn't sure what they had sold me. Finally I purchased another parallel port because I was told by Alps technicians that the Alps could be finicky with other printers or devices. When you install another port, the second port is assigned to LPT 2, with the first one being LPT 1 with all the other peripherals on it. Well, the Alps wanted to be on LPT 1, so all my drivers had to be uninstalled from LPT 1 and then reinstalled to LPT 2, so the Alps could be assigned to LPT 1. It finally worked. After a week of store errors, wrong switch boxes and cables, dealing with a printer that matched Greta Garbo in its "I want to be alone" stance, I was so frustrated, I didn't even test it for another few weeks. But I absolutely love the printer now and would go through the ordeal again if I had to. My advice to anyone interested in the printer is to make sure you have the right cables, switch boxes, additional ports or whatever you need before you start. And you might give the Alps technical support a call and discuss with them what your setup is and what other devices you have attached to your computer before you decide on how to install the printer. On a happy note, though, the dye sublimation upgrade was a snap to install. There is a small key you insert in the back of the printer and special drivers, paper, and ribbons are provided with the upgrade kit. Manuals: There are two manuals that come with the printer. One is printed, the other is on the CD. I was not overly impressed with the manuals. Computer users vary when it comes to liking printed material. I have friends that never open a computer book for software or hardware. On the other hand, I am a reader and like books and user guides. With the mass marketing of printers and the lowering of prices, something had to go, and it was the quality of the manuals. Since you can do so much with the Alps--print with foil and metallic colors; use white ink for printing on dark paper; print on both sides of the paper; and print overlays, I thought the material was not well organized nor complete enough for what the printer can do. 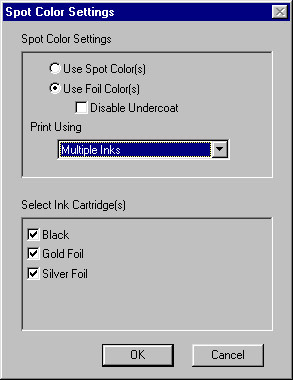 For instance, when printing silver and gold foil colors with CMYK colors, the manual states to use the overlay mode if you have problems. But information on overlay is in another chapter; the information is scanty at best; and further information about settings for this type of printing were found on the last page of the 89 page manual. This is not just a complaint I have about this printer or device. I have been purchasing printers, scanners, and general computer equipment for over 10 years and I still have the manuals that came with the items. In those days, the quality of the manuals was to die for; you usually got more than one printed manual; they were extremely thorough, and actually printed out. You didn't have to go to the trouble to print out a 100 page manual. Nowadays, even with the more pricey items, you are lucky to get a printed manual, much less a thorough one. Many are skimpy. And if they are large and you have to print them out from the CD, it can be time-consuming. Most computer users are familiar with inkjet or laser printers, but many know nothing about dye sublimation printing as most other dye sublimation printers are priced out of the range of typical users. I think the quality you get from the Alps is as good as or better than the other inkjet and laser printers out there and it would be an excellent choice for the average business or home user. 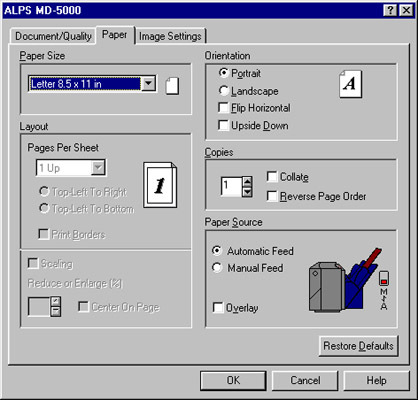 A thorough manual wouldn't hurt to familiarize the computer user with this type of printing. 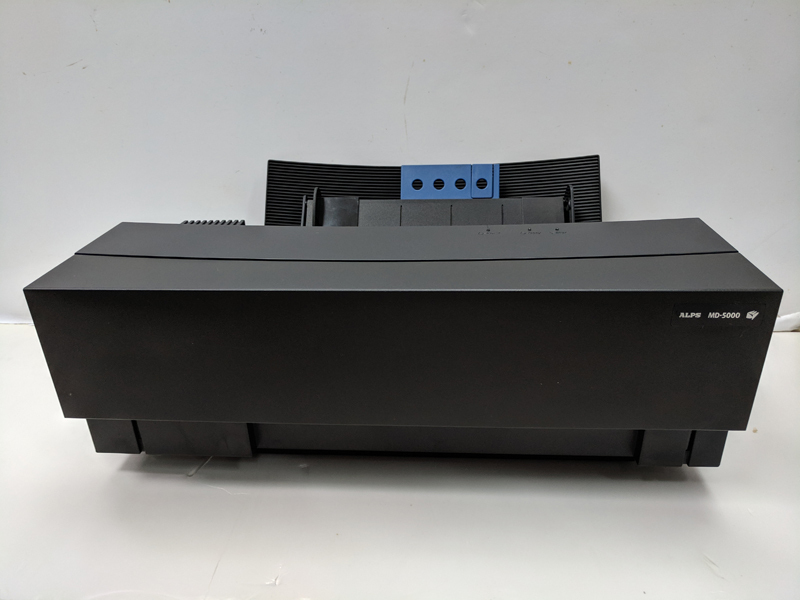 Specifications: Compared to the large and bulky inkjets and laser printers on the market, the MD-5000 is a compact printer that will not take up much room on a desktop. It is about 18.2 inches wide by 11.8 inches deep by 7.5 inches high and weighs about 11 lbs. 8oz. There is a pullout tray, which retracts when not in use, to receive the printed paper. There are no ink cartridges. 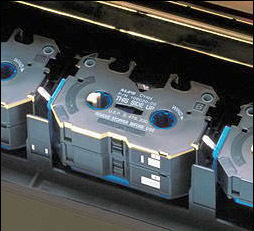 The printer uses a variety of ribbon cartridges which are easily installed in the four cartridge holders at the front compartment. You can install up to 7 ribbons, depending on the type of printing you are doing, leaving one position open for cycling. There is a high quality black cartridge, as well as a basic reusable black cartridge, which can be used over and over again. There are the standard magenta, cyan, and yellow cartridges, which are not reusable; a primer ribbon cartridge that can be used to prepare many papers for printing, even standard off-the-shelf photocopy paper; and a finish cartridge for a glossy look. For dye sublimation printing, you use a different set of ribbons. There are also ribbons so you can print with metallic colors, use silver and gold foil colors, and print in white. 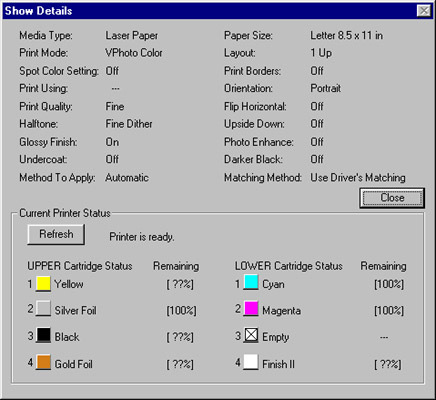 Printing: There are a variety of settings and dialog boxes you have to familiarize yourself with when you use the MD-5000 printer. You have two choices for feeding the paper into the printer: manual and automatic. 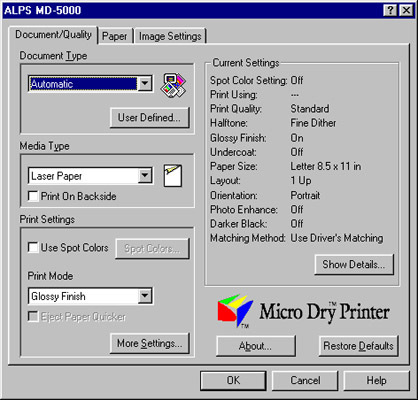 All settings are found in the Alps Properties dialog box, where there are three tabs across the top of the screen: Document/Quality; Paper; and Image Settings. Under each tab are other options. Document/Quality--This is where you choose three options: (1) Document Type such as photographs, graphics/text, grayscale, etc., or choose automatic and let the printer determine the type; (2) Media Type--what you print on--is also selected. You have a variety of choices: Plain; Laser; Transparency Film; Vp hoto Print Film; Vphoto Paper (4x6 plus); Photo Realistic Label; Photographic Paper; Photographic Label; Cardboard; Iron-on Transfer Sheet; and Back Print Film. The Vphoto Print Paper is used for printin g at 2400 dpi and the Photographic Paper and Labels are used for the dye sublimation printing; and (3) Print Settings: standard color, glossy finish, Vphoto color, or dye sublimation, as well as spot color settings. Different settings affect the choices in the other boxes, and the printer will actually remind you or warn you about certain settings. 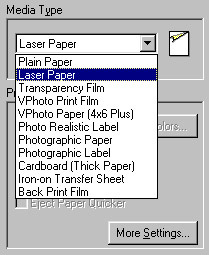 Paper--Under this tab, you choose paper size; layout; orientation of paper; how many copies; paper source; and overlay. Overlay is a neat feature that allows you to print two consecutive pages on one by keeping the paper in the machine after it has printed so you can change the ribbons and print a second page on the same paper. Image Settings--Your color control options are under this tab. You select photo enhancement; image brightness and/or contrast; and you have further color matching or color balance options. How Printers Work; Advantages/Disadvantages; and Print Quality: I tested the printer against a variety of laser and inkjet printers. I printed in color, black & white, and grayscale, and I printed full color pages, used the foil colors, and spot color. The quality was as good as or even better than what was produced on either the color laser or the inkjet printers. Many people buy two or more printers it is difficult to find just one printer that prints crisp text and color graphics or photographs. The MD-5000 gives you exceptional results in both text and photographs at an affordable price. Below is a discussion of different printing technologies and their strengths and weaknesses. In determining what printer to buy, I feel it is not necessarily a decision on which is better but what is more appropriate for a persons needs, i.e., what is it going to be used for, and what can you afford. Inkjet Printers--Inkjet printers spray ink through tiny jets, or nozzles, onto the paper. All in all, inkjet printers deliver great and affordable results, but there are some downsides. The ink from an inkjet printer tends to migrate, or spread out, on the paper, making the print look less sharp because the "dot" is less defined. This is where you get jaggies or jagged text. A harder, less absorbable paper, such as paper with a glossy surface, helps contain ink migration, but the ink might take a few minutes to dry. You should handle a page, especially one with a lot of dense color on it, with care. Inkjets can be slow. It takes a lot of time for the print head to scan across the page and deliver ink. There are printers that are designed specifically for printing photos which give good detail and very accurate color. Although you can use plain paper to get a quick draft image printed, a better paper grade, such as a good-quality laser paper, yields better results. Inkjet prints fade quickly and smear easily unless they have a protective coating. 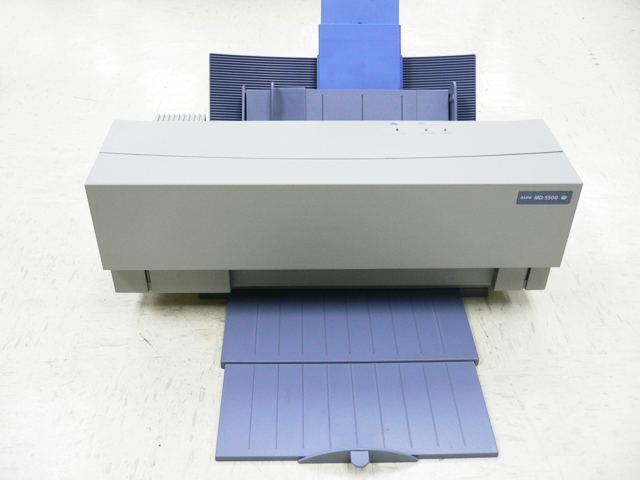 A good photographic inkjet printer can give you outstanding quality images on special paper. They are also good for general office work where you want an inexpensive printer that can handle volume. Many of the older versions used only one cartridge filled with cyan, magenta, and yellow ink and one cartridge filled with black ink. You would have to throw out the whole cartridge if you ran out of even one color. Numerous new inkjets come with separate color cartridges and this is a consideration if you do any volume printing. Also many of the newer inkjets can give you good quality output on laser paper. Color Laser Printers--Color Laser Printers have a drum that is charged with static electricity. The drum picks up colored toner, which sticks to the static. The drum transfers the toner to the paper. The toner is then thermally fixed to the paper. Color laser printers deliver great color, but they are expensive. You can use plain paper but a better quality paper will produce better results. Laser printers produce great looking and crisp text, but are not noted for the quality of printed photographs as they are not continuous tone printers. Micro-Dry Printers--Micro-Dry printers are much like dye-sub printers delivering resin-based ink via thermal transfer from a ribbon. You can use any paper with a micro-dry printer. There is a slight banding. It is questionable whether this is from where the half-inch ribbon swaths stitch together or from thermal technology, but this banding is common to many printers that print in a row, so some banding is natural. The banding can be avoided by selecting different backgrounds or subjects. 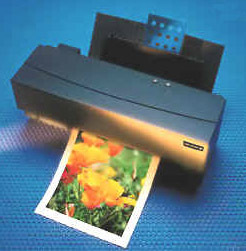 The MD-5000 can produce vivid and photographic quality prints because it is a variable dot printer. The Alps patented printer insures exact control of dot diameter, resulting in superior print quality. This unique technology combines a thermal controller chip and an Alps Micro DOS (Deposit on Silicon) print head. The controller creates a precision, high-density print pattern for each dot, selects the correct ink and fuses the image to the print surface. The printer is able to size the pixel into three perfectly shaped dots, accurately registered. Have you ever designed an image, picked great colors, and then printed the image on colored paper and you get totally different shades of the colors. Well, with the Alps this doesn't happen. Since the ink stays on the surface, you can print on colored paper without the color changing the color of the ink. We tested the MD-5000 against other laser and inkjet printers and it produced excellent results in the micro-dry mode. The text was clear, the colors were sharp and vivid, even on just laser paper such as Hammermill. The inks cost under $10 per color and seem to last. Dye Sublimation Printers--Dye-sub printers work by transferring colored dyes by heat (for this reason, you might also have seen these printers referred to as thermal dye sublimation printers) The dyes are held on a ribbon or roll and transferred to the paper when heated. When the dye hits the paper, it sublimates, or sinks into the paper--it does not sit on the paper surface. You cannot use plain paper in this process; you must use paper that is made especially for this process. When you use the proper paper, the dye spreads out a bit on the paper's glossy surface and mixes with the other colors, producing a continuous tone much like that found in a traditional color print. The prints from the MD-5000 using this mode were outstanding. You get an extremely professional look from just a desktop printer. Until now, a full-page dye sublimation printer has been to expensive for most people. The cheaper models printed only smaller pages. 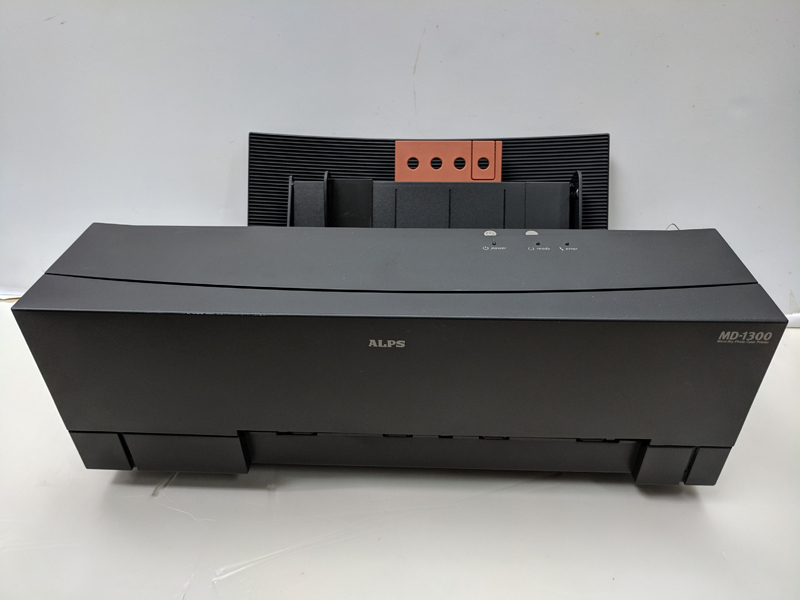 The Alps MD-5000 gives you a wide range of print modes that produce quality prints, provides sharp images of skin tones, black & white photos, and the fine detail of a high quality laser printer but it has a price closer to that of an inkjet. It is great for brochures, newsletters, and flyers where you want crisp text and quality graphics. The reusable black ribbon cartridge makes it economical for printing drafts. Also having the inks in separate containers saves you money. Having prints that are smear-proof, fadeproof, and water-proof is important for many users. They can be handled immediately. I did not find the MD-5000 to be overly slow for the quality of output. It is slow when you print a full color page, but all printers are rather slow when printing full color pages. I would highly recommend the Alps MD-5000 for anyone seeking affordable high quality graphic output and sharp, clean text from a single printer.